In the beginning, organisations are always customer centric, focussed on solving real problems and delighting customers. But somehow as they grow, lots of other ‘stuff’ interferes with this relentless customer focus. Time is consumed with managing people, managing cash, operations, suppliers, systems, business planning, strategy execution and the list goes on. All incredibly important for a successful business but they detract from that single minded customer focus that existed in the early days of a business. So to keep customer value front and centre, you need to develop behaviours and habits to focus on customers and it must be practiced regularly involving everyone in your organisation. The process I recommend is Customer Discovery. First developed by Steve Blank as the initial stage of a new approach to building a business, this adapted method provides a simple process you can use to create a habit of focussing on what customers really value. The first step is to be very specific on the customer segment and within this be clear on your ideal customers within these segments. Have a look at my blog on Ideal Customers for more background. Then think about Customer Outcomes, this gets the team thinking about what your customers are trying to achieve. Put yourself in their position, if you were running their company what outcomes would you be focusing on? At a basic level, Customer Outcomes can be grouped in to three areas: Increasing sales, reducing costs and achieving their purpose or goals. Don’t underestimate emotional outcomes even in a B2B situation. What’s their business strategy? How do they achieve it? How do they increase sales and reduce costs (to create economic value)? What factors are disrupting the customer segment? What ‘job’ is the customer going to use the product or service for? But you can’t deliver customer outcomes directly, you have to identify and satisfy their needs and problems to help them achieve their outcomes. Customer Needs are based on the problems that your customers are focussed on solving and what key projects they are driving to help them achieve their outcomes. Think about your customers as individuals, each person in an organisation has specific needs. What does value mean to them, think in economic, functional and emotional terms. What improvements do they want and how much does it matter? What are their biggest pains and how much do they hurt? How do they manage risk when adopting new solutions? What gets them to celebrate? How do they measure Return On Investment? Which of their problems are most urgent? But be careful, if you simply ask your customers what they need they will tell you what they believe they want, but it may not be what they really need. The key is to gain Customer Insights, these are customer needs which they don’t recognise until you show them a solution. The classic example is Henry Ford and the motor car, his customers would have said they needed faster horses as they couldn’t conceive of the automobile. More recently the AirBnb story shows insights in to customer behaviour. Joe Gebbia’s Ted Talk on ‘How Airbnb Designs for Trust’ describes how they worked out that the key to increasing bookings was to build trust between the apartment owner and prospective guests. They focussed on designing a review system which both encouraged feedback and ensured the right amount of disclosure. Their focus on review system design was the insight which led to Airbnb’s explosive growth. Insights are critical because your customers don’t know your capabilities, you are looking to develop a deep picture of their desired outcomes matched with your unique capabilities to produce solutions which delight them. What do your customers dream about? What would go beyond their expectations? What risks do they fear taking? When you’ve got the canvas full of Customer Needs and Insights you need to create some structure. 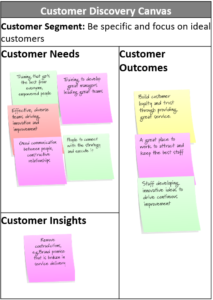 The team will have created post-it notes which are similar, so group these similar post-its together. 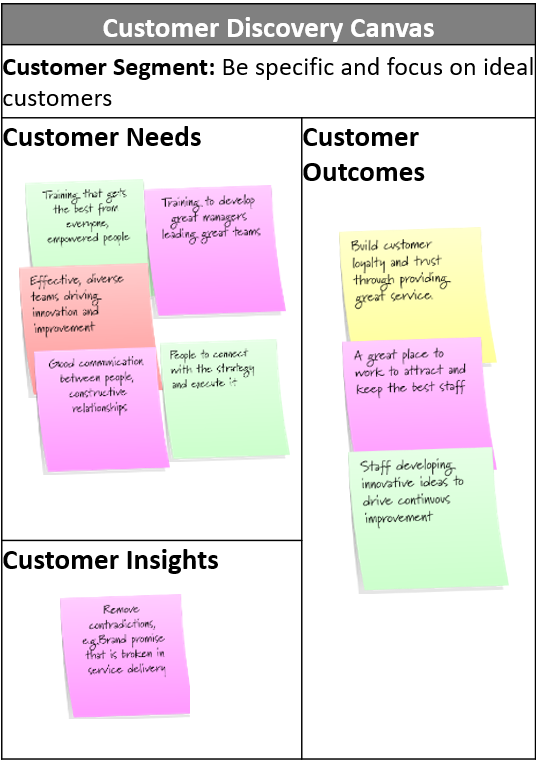 Then rank these needs and insights in order of importance, so that you end up with a prioritised set of customer needs. The easiest way to get a group to vote on priorities in with sticky coloured dots. The number of dots depends on the number of things to be prioritised but my rule of thumb is for each team member to put 3 dots on the most important, 2 on the second most important and three further single dots on their third, fourth and fifth group. Alternatively you can generate a set of ‘Postcards’ which describe the needs and insights as you have identified them. Take these to customers and get them to rank them in order of importance from their perspective. It is imperative that you also have ‘blank postcards’ as there may be needs that you have not identified, so you need to get your customers talking about areas that you may not fully understand. This is a two way conversation so you need to be thinking about how you can help them rather than just asking questions. Customer Discovery is about uncovering new ways to go about doing things. Once you develop the habit of Customer Discovery, this naturally leads to you offering solutions which resonate with your customers most important needs. And that is when your customers will recognise true value in what you’re offering. If you create this process as a habit and use it across your organisation, you will ensure that you remain a customer value driven organisation as you grow, no matter what distractions try to throw you off course. To see how Customer Discovery fits in to Value Proposition development take a look at my SlideShare on the 7 step process to develop Customer Value Propositions so that you create clarity on Why customers should buy from you.